Boeing announced this week that it will discontinue the producion of the C-17 Globemaster III in 2015. As an Airbus Military employee working for the A400M (a competitor of the C-17 in export markets), I take the announcement with some relief (if the production really comes to an end). On the other hand, as an aviation enthusiast I gave it another look. As some media reported, the C-17 was the last aircraft assembly line of Boeing in Long Beach (California), this line shut down marks an end to an era. The C-17 is a legacy program from the former McDonnell Douglas which merged with Boeing in 1997. All the other McDonnell Douglas aircraft programmes which were manufactured in South California at the time of the merger were already stopped during the 5 years that followed the merger (including MD-80 variants, MD-90 and MD-11). The activities of McDonnell Douglas in South California date back to those of the former Douglas Aircraft Company which merged with McDonnell Aircraft in 1967. 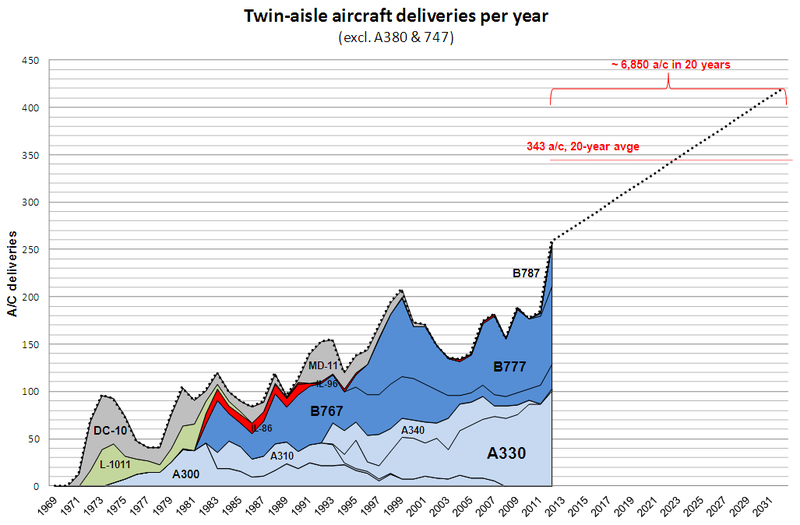 All those MD-80/90/11 have as origin the DC-9 which first flew in 1965 and which together with its derivatives is still the 3rd most successful commercial airliner ever (only behind the 737 and A320 families). I see the closure of the C-17 line as the end of Douglas heritage. In this post I just wanted to pay my small tribute to Douglas Aircraft Company one of the key companies in the history of aviation. Douglas career (source: Popular Science magazine, October 1940). 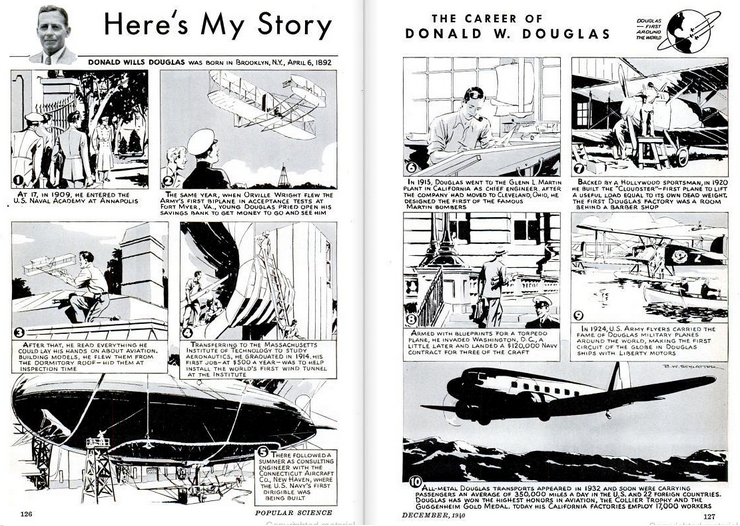 The last picture in the comic-like biography of Douglas above shows a Douglas Commercial DC-3. One simply cannot overstate the importance of the DC-3 in the history of aviation. The DC-3 came as an evolution of the DC-2, and with its improved range and payload capacity it revolutionized both commercial and military aviation. Hundreds of civil aircraft were produced, over 10,000 military versions. The military version C-47 Skytrain came to be one of the iconic aircraft of the World War II first and later of the Berlin Airlift (see this post I wrote about our visit to the Berlin Tempelhof Airport, where today a DC-4 is displayed). The Douglas Aircraft Company was mainly producing military aircraft until it received in 1932 a letter from Jack Frye, the VP Operations of the iconic airline Transcontinental & Western Air Inc., bettern known as TWA. Jack sent the same letter to 3 aircraft manufacturers (the others being Curtiss-Wright and Glenn Martin) inquiring whether they would be interested in producing an aircraft in response to TWA’s specifications. This came as a response to the launch by Boeing of the 247, which first 60 units were to be destined for its affiliated airline, Boeing Air Transport (both then part of United Aircraft and Transport Corporation). TWA feared that not having access to the 247 for the first years it would lag behind, and thus took the step forward of asking manufacturers to build the aircraft they needed. 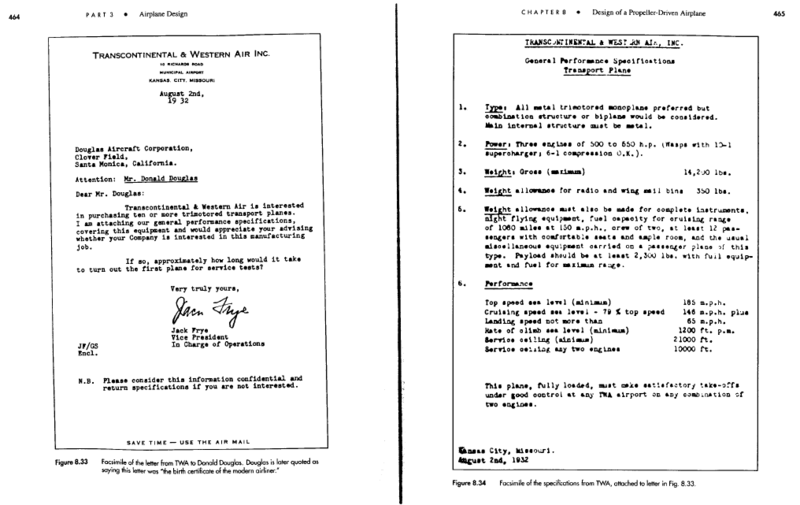 Letter from TWA to Douglas and specifications for a new airplane design. The chapter describes the different discussions among Douglas’ senior engineers, exchanges with TWA, negotiations, etc. All the technologies employed in the aircraft were already existing in different models. The greatness of the project was in putting them together in one plane (the use of Northrop cantilevered wing, low-wing monoplane, retractable landing gear (to reduce drag), use of flaps (to allow low landing speeds – 65mph as per the spec), use of NACA cowlings to cover the engine…). There was another great contribution to aeronautics of this development project and that was the one-engine-out performance, required in the specification; though the specification demanded a tri-motor which was able to take-off and cruise with any two engines. To that request, Douglas responded with a detailed analysis of safety in one-engine-out situations, which it presented at the UK’s Royal Aeronautical Society in the paper “The Development and Reliability of the Modern Multi-Engine Air Liner with Special Reference to Multi-Engine Airplanes after Engine Failure“. The first test plane that came as a result was the DC-1, the production aircraft that followed the acceptance of the prototype was named the DC-2, and the DC-3 was an enlarged version that resulted from another request from American Airlines, which wished a version of the DC-2 capable to carry litters for overnight travel, that came to be the Douglas Sleeper Transport (DST). Douglas worked on that version but immediately saw that the potential of that enlarged version was not in the sleeper version but in having extra payload and comfort for seated passengers in comparison with other airplanes at the time. The DC-3 reduced direct operating costs (DOC) to 60% of those of the Boeing 247, thus converting it in a money maker for the airlines and allowing many more people to afford air travel. In the following decades Douglas positioned itself as the leading commercial airplane manufacturer until Boeing took this position around the 1960s. 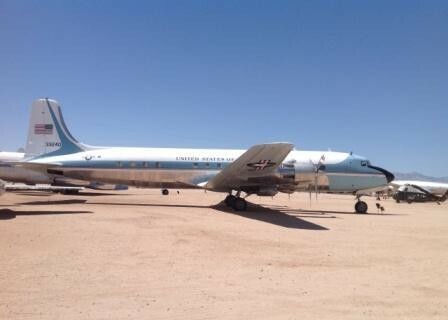 Several models came during those years: DC-4, DC-6 (which came to be the Air Force One during Kennedy and Johnson presidencies, see the picture below taken at the Pima Air and Space Museum), the mentioned DC-9 with all its later variants, etc. DC-6 (VC-118), Air Force One during Kennedy presidency (at PImar Air and Space Museum). Logos from Douglas (prior to 1967) and Boeing (after 1997 merger).